A great time was had by all. 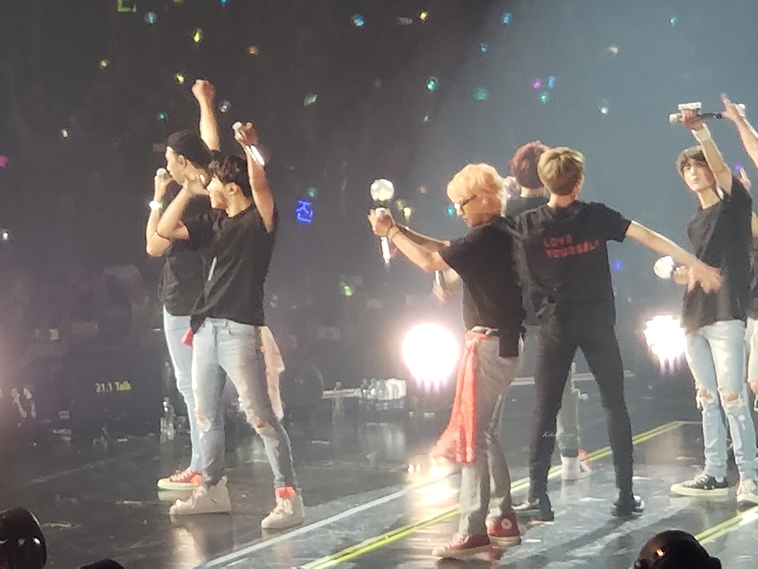 Is that enough to say about our BTS concert at the Staples Center? No? Somehow I didn’t think so. Let’s get this started! I’m so happy to say, they have never in any of those times, disappointed. 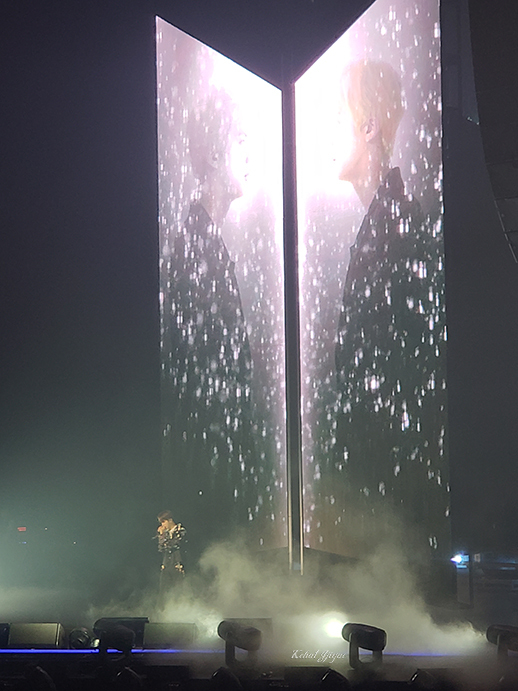 The Thursday show at the Staples Center for the Love Yourself tour was no exception. Coming into this concert, I had been a little concerned. The first two CD’s of the set made me concerned that they were moving away from the sound I came to love and expected and worried that they were bending to suit an American audience. This wasn’t what I wanted for them. 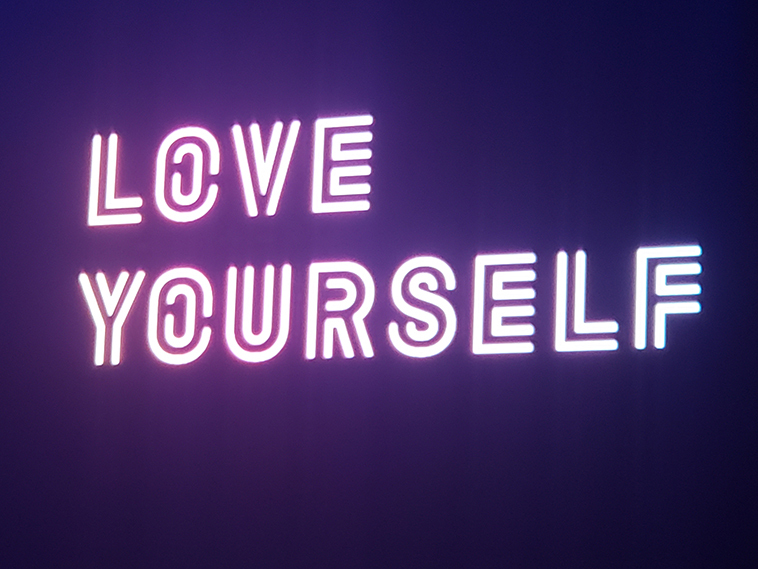 But with the release of the third and final CD of the Love Yourself trilogy, the videos, and performances, it made you realize the spark of what I loved was still there. That they didn’t really care what we thought. They were going to do what they wanted, what made them happy. Which in turn, made me happy. That’s what I want for them. I love this group so much, I don’t care if this particular story arc wasn’t for me, if this is what they wanted to do? Then I’m all for it. I needed to see that sass of the final album, it’s what finally let me let go, let me breathe a sigh of relief and, in turn, allowed me to sit back and enjoy what they were sitting in front of me. So, beforehand, it was a rollercoaster of emotions, but by the time the concert was there, I was on board, I was excited, I couldn’t wait for it to begin. 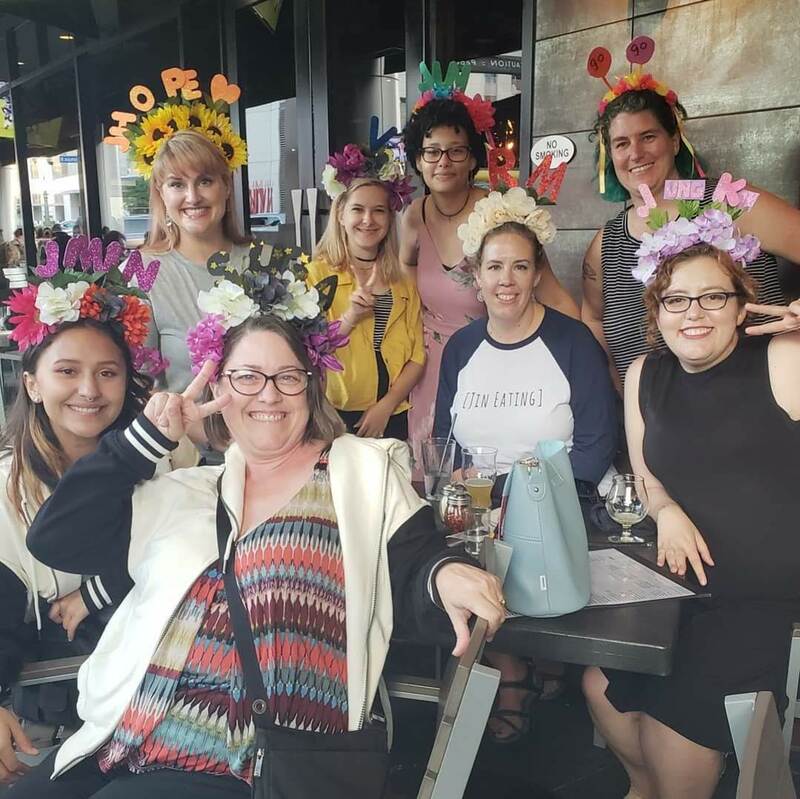 We started out the day with a trip to the BT21 store (you can find the post on that here), we waved Alix and Liz C off to their soundcheck adventure (we weren’t jealous at all, no, we were happy for them….) and headed off to the Staples Center for our own adventures. 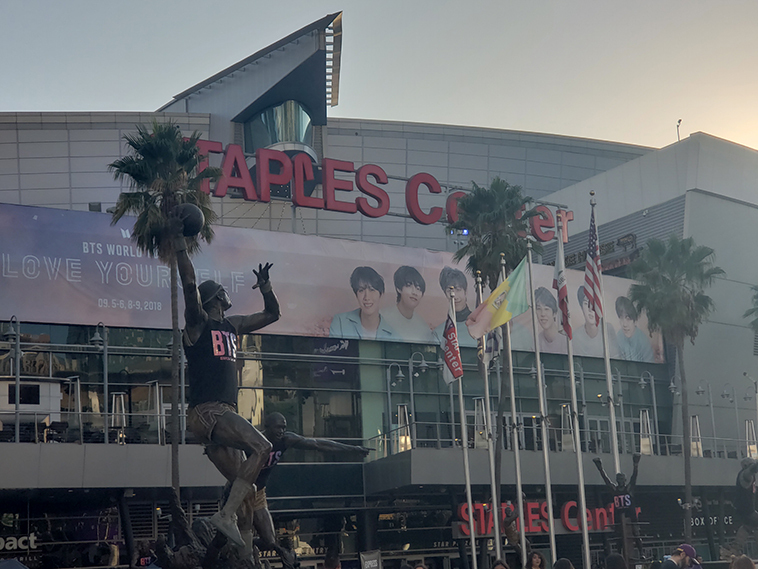 Once we got there it was so cool to see the Staples Center bedazzled in BTS gear. They even got into the BTS spirit and bedecked all of their bronze sculptures with BTS jerseys. From there we split up into our seat pairs, Cherry and Mystical Being of Unicorns, Molly and LizC, and Alix and I. Luckily, thanks to the super luck of LizC and Alix, our pairs had great P1 seats. Cherry and the MBoU had great luck for the Wednesday night show and this was an auxiliary night for them. We quickly found our seats, squeeed over the view, took our headbands off (as we’re not view blocking monsters) and waited for the show to start. Just like any Kpop show, they were playing music videos and the place was crazy singing along, just screaming in excitement when a popular song showed up. Everyone was also trying out the newfangled lightsticks. These 3.0 versions not only lit up, but, after being programmed to your seats, changed colors, flashed, and changed in time to patterns programmed into the night. Throughout the concert, it was crazy to see not just the usual sea of lights but a sea that was completely interactive with the program. 3.0 indeed. I was a little bummed that Kpop is really hammering down the no camera policies. Before it was just no professional cameras but now, the last few concerts I’ve been to, it’s been a ban on all cameras in general. So these photos came with my phone. Hrm. The band came on to screams from the crowd. It was amazing. They started out with Idol. Actually, this was one of the first concerts I’ve gone into where I’ve cheated and went in knowing what the setlist would be. This time I needed to know, wanted to be prepared for what I would and would not hear, however, I didn’t cheat so far as to watch any of the performances — I just like to go in fresh to those. 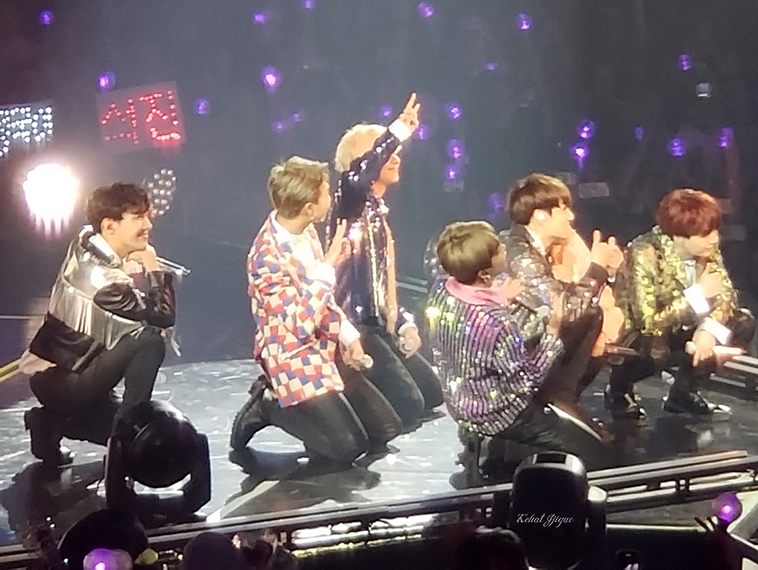 Like the Wings tour, the group not only did songs all together as a group but also did their own, solo songs. For some reason, Yoongi’s song Seesaw, all could hear in the lyrics was “I like cheesecake because cheesecake is yum.” sound funny? Listen to it again, and you’ll hear it for yourself. Luckily after the concert Cherry Cordial dug out the actual lyrics and explained he wasn’t actually singing about cheesecake but instead a really sad breakup song….I’m not entirely certain he’s not still talking about cheesecake. Who hasn’t eaten their feelings after a bad breakup? 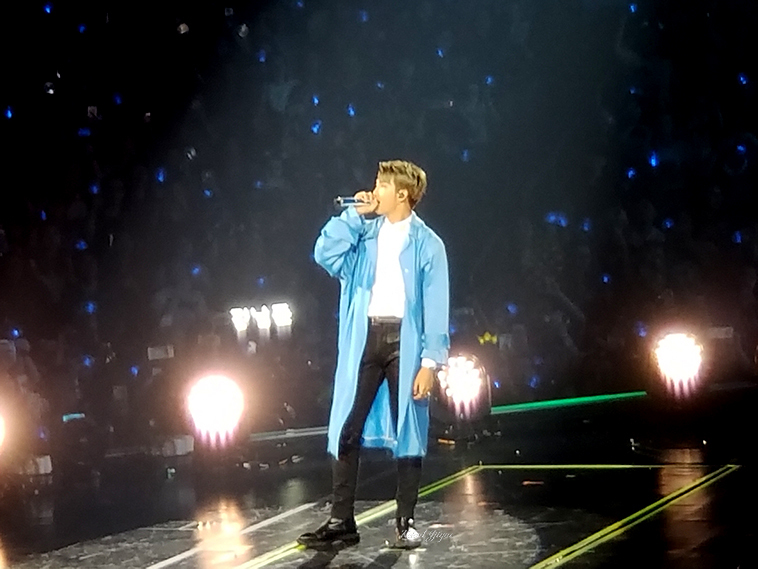 My favorite solo performance would have to be Tae’s. 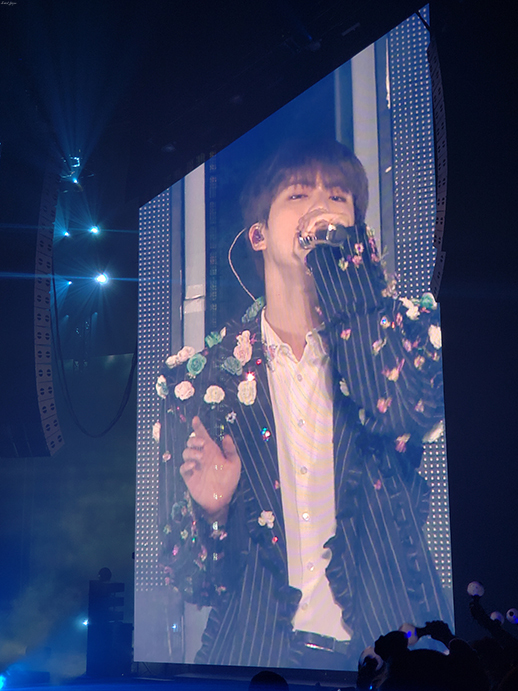 The song is not only so pretty, but he really has the drama to fill out that performance. his facial expressions, his movements, you can tell that he has that acting ability in him. 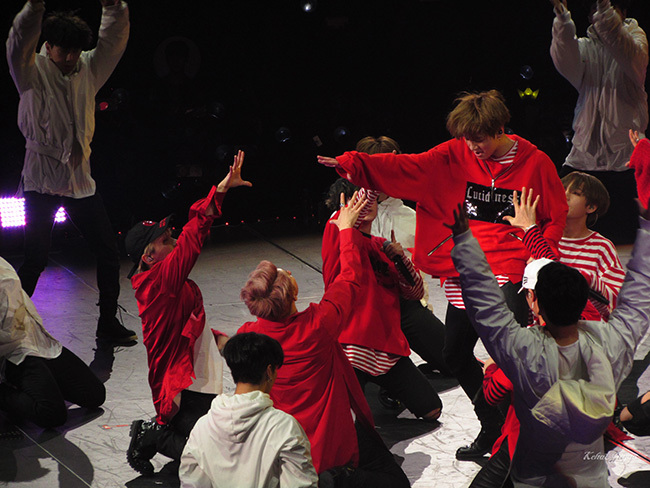 I also loved the backup dancers he had, completely in black, dancing with the faces behind him? So added to the performance. Not sure if he needed the backup dancers who just danced with him after that though. Actually. 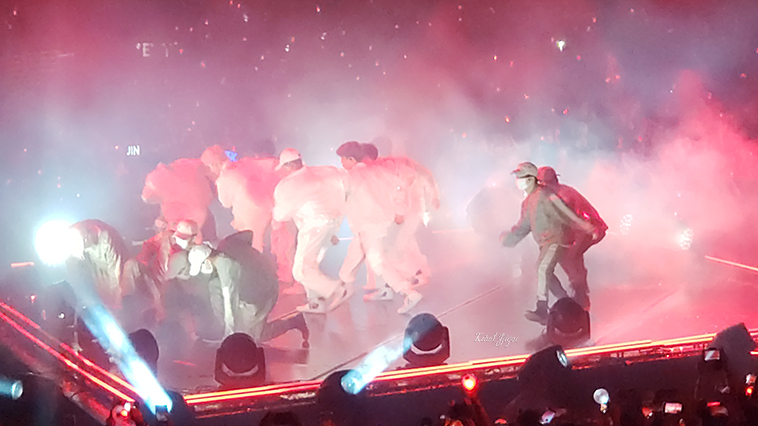 If I were to say one thing about the performances, there were a lot of backup dancers who weren’t really needed, not only during the solo songs but during the group performances as well. 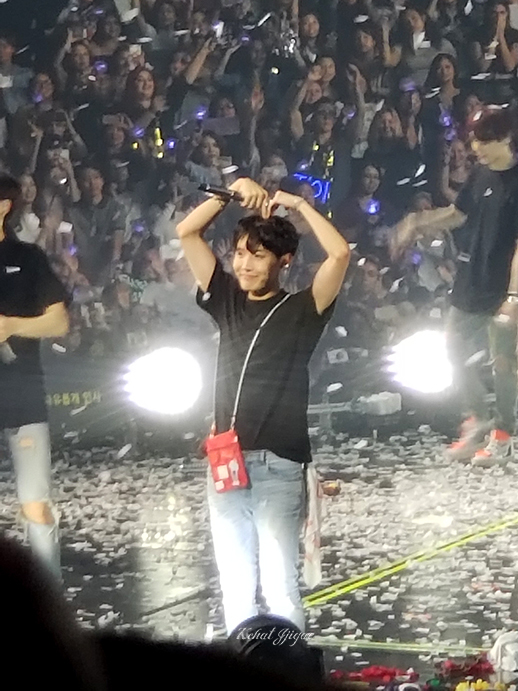 BTS are such strong performers, I’m not really certain they were needed at all! 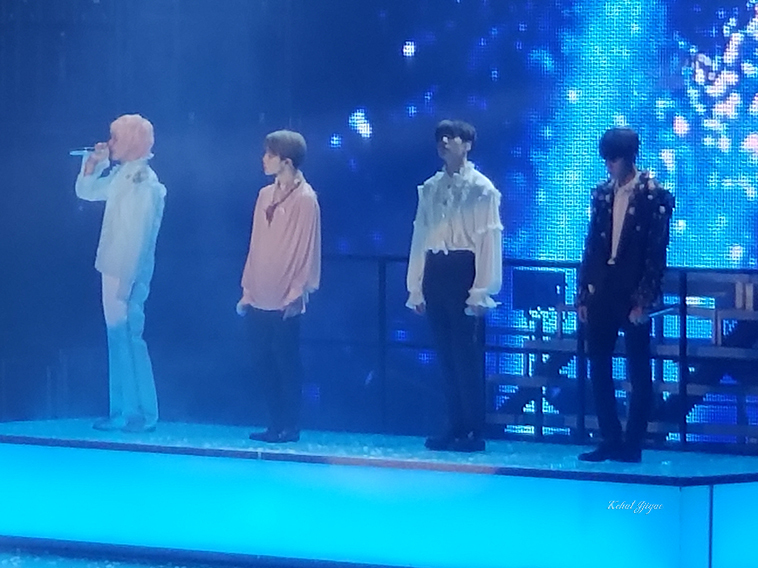 One of my other favorite performances was Truth Untold, sung by the vocal line. The more I hear this song, the more addictive it is. It’s just so freaking pretty! 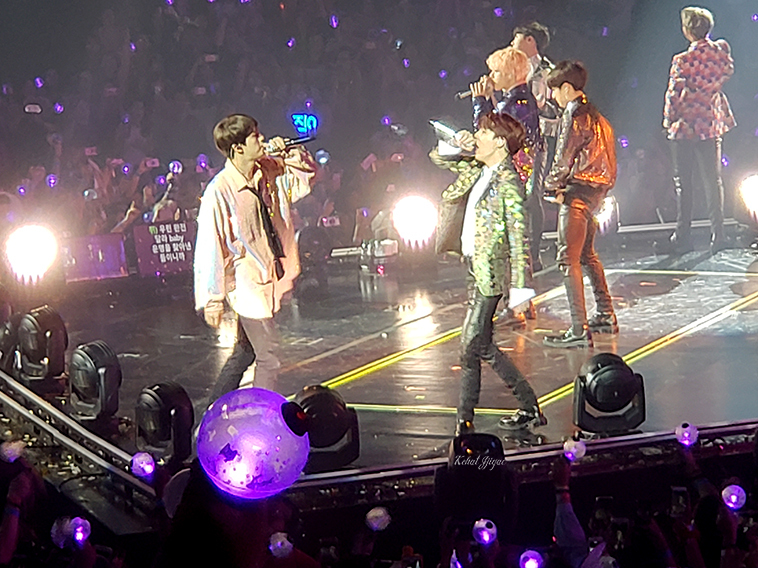 This set of CD’s it really seemed as though this was BTS saying “Your turn, guys.” and in this song, they knocked it out of the park. I was really excited we got a rapline song. I do miss my Cyphers and I hope to see them back in the next album. But for now? I’m covered. Also a little bit mind-blowing? Seeing Mike Drop in person. Love this song and happy to say Hoseok KILLED it. 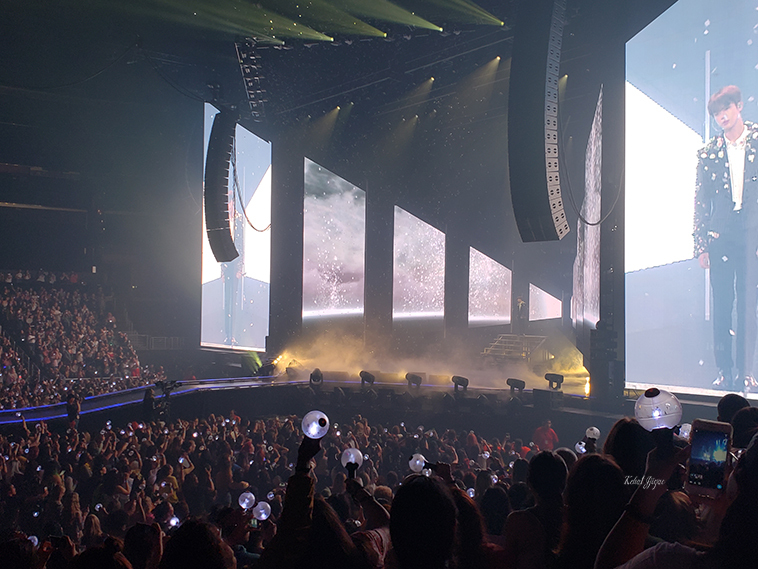 While I told you about the sea of 3.0 lightsticks, the other set design I could tell you about was the giant screens. yes, they are the norm for concerts this size, so everyone has a chance to see the members close up, and they had the great videos, during breaks, profiling the members, moving from one screen to the other, working together so it’ wasn’t just like a video playback, but the screens were also used to enhance the performances themselves. Outside the large screens, they had smaller panels which moved around the stage, creating action and depth. it wasn’t just your standard static monitor, it became part of the act. I did send LizC a Message after seeing Jin’s jacket. Looks like their costume department shopped for florals at Dollar Tree too! Our headbands were just that much more on point. 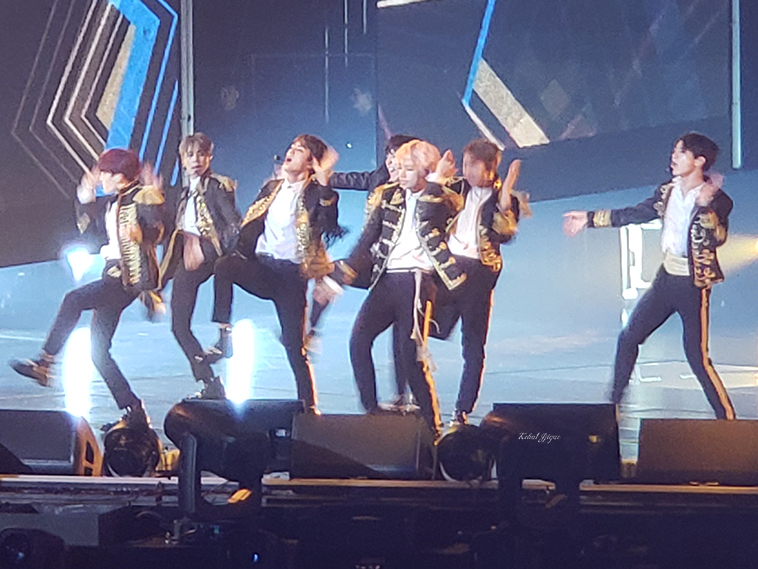 There was one song that, turns out, I’d never seen the choreo for. Airplane Pt 2 had members standing on chairs, carrying and dragging mikes around the stage. I’m not sure why I found it to be so fun…but I did! It was just so cheeky. The costumes were….interesting. There are several times when you sit there looking at an outfit and go…huh. There didn’t quite seem to be an overarching theme in it. 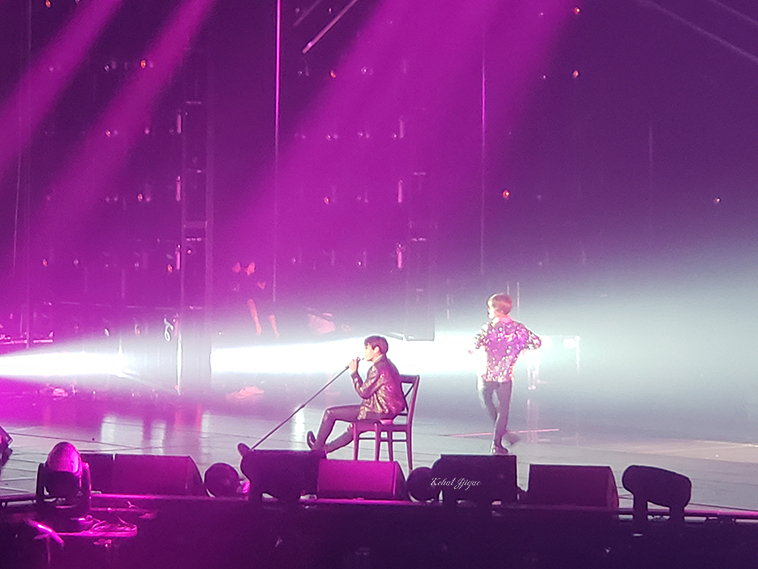 My favorite was Yoongi’s red solo top (which unfortunately I could not get a photo of). This actually gave the Herd quite the mystery to solve. We’d seen his solo outfit in pics from the Seoul concerts which had him in the red top and red almost sparkly pleather pants. Our concert? Same red top but plain black dress pants. After the concert, Cherry told us at her Wednesday show, he was wearing the red pants. So what happened? Did something happen to the pants? Did Yoongi put his foot down and say NO I’m not wearing sparkly red pleather pants? Did they accidentally get trashed backstage? Sometimes they change costumes for the US shows, but so far it was just these red pants that had a quick change. 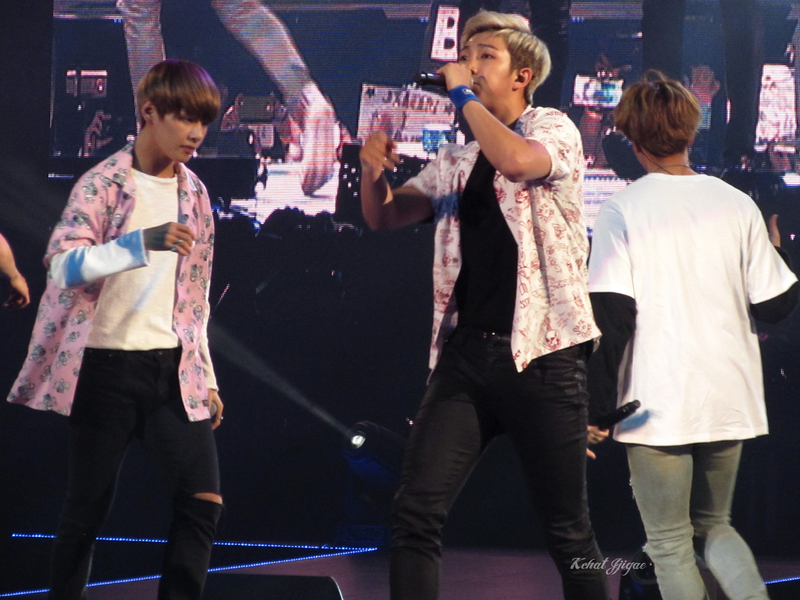 (Well, that and Jungkook’s cape shirt, but it’s entirely possible RM was wearing it.) Our friend Alexis came into town for the Saturday show and we begged her…tell us what color his pants are. Message sent? Black pants. All other US shows? Black pants. Our guess thanks to Cherry Cordial? During one part of the performance, he has to slide down this bench and in our concert, he makes it down to the bottom no problem, in hers? He slid to a point stopped, and hopped off. Her hypothesis? The pleather pants just couldn’t make the move and were swapped out. 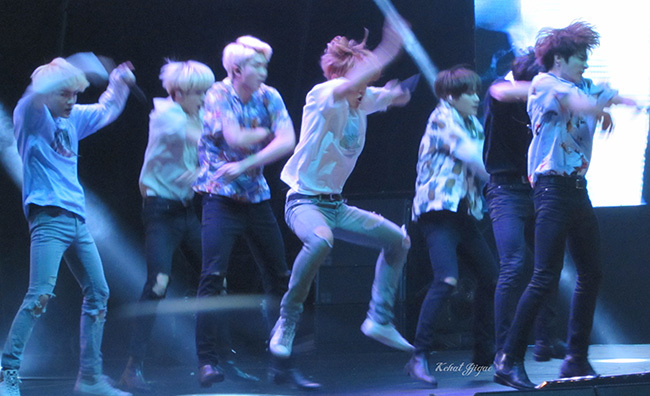 I still vote for Yoongi “accidentally” tearing them. We were sad to see them go. Especially since they’re just getting started on this world tour so it’s going to be a while before they come back. But they leave us with these great memories. They gave me back my BTS mojo. Thanks guys, see you next time. You can see my whole collection of pics here! Pretty nice photos, even with a phone. Thanks for sharing!